Urban Adventure League: Three Speed Ride a success! Three Speed Ride a success! 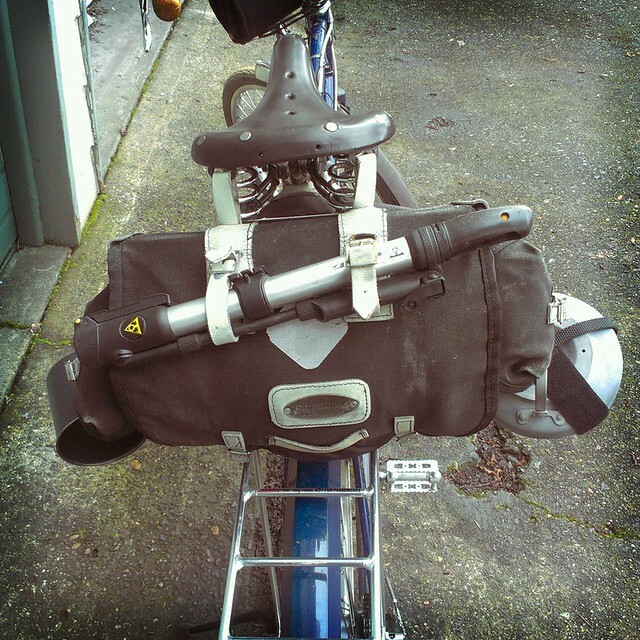 Ready for the ride: A teakettle and a cup. I must admit, I was stressing out a bit before this ride. While this was not the first Three Speed Ride I've done (it's actually the fifth), it felt like the first one again, with it being the inaugural ride of the Society of Three Speeds. It felt like there was a lot riding on this one, due in no part to the increased attention. Thankfully the weather co-operated! Despite a meh forecast leading up to Sunday, and a short sprinkle before the ride, the weather held for the day: a mix of sun and clouds with a high of 51F/11C. Oh, there was a small cloud that provided about two minutes of slight drizzle half-way through, but that was it. Marvelous weather, indeed. And people! We had fifteen fine folk show up for this ride. At Kenilworth Park introductions were given, mingling commenced, and we had our "official" picture. Then it was off! I planned quite a meandering route through SE. I wanted to use as many hidden paths and unpaved lanes as possible. It was barely a quarter-mile in where I introduced the first narrow unpaved path, just right off Holgate. I also routed the course through the campus of Reed College, which meant a crossing of Reed Canyon via the "Blue Bridge". But the "Rough Stuff" portion of the ride took hold over a mile in, when we entered the very English sounding neighborhood of Woodstock. Woodstock is renowned for its unimproved roadways, and I introduced the group to the small steep unpaved path that is SE Martins at 38th. Everyone had to dismount and walk. From there we wound our way on more unpaved roads for about a mile. Everyone's bicycles handled the rough stuff well, and no one got swallowed up in any of the puddles, fortunately. After this it was back to the "metalled" surfaces and a brief stop at Mount Scott Park. From here the ride trended from eastward to northward, and in no time we were in Montavilla. Here came the biggest challenge of the day: the climb up to Mount Tabor. Tabor is the highest point on the east side of the city, 650 feet (200 m) high and one of the best views we've got. If you've ridden your bike enough around these parts enough, you'll know that the shortest way up Tabor is from the east, as Montavilla sits higher up than the lands to the west of Tabor. But it's still a climb, no matter what. I led the group up SE Taylor Street from SE 80th to 69th. The grade maxes out at about 8%. 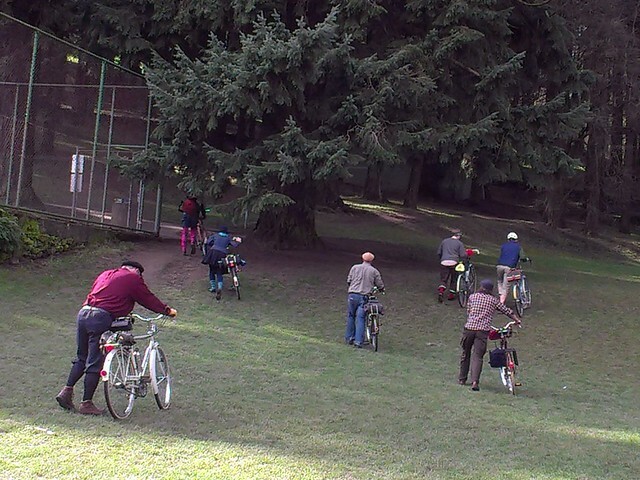 Still, most everyone managed to get up without dismounting. In the park was the big tea-and-ceremonies stop. 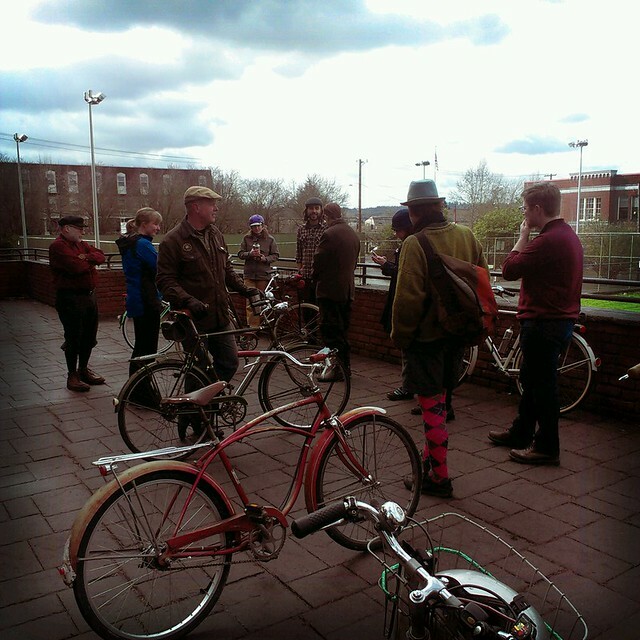 Here I gave out the membership kit to Society of Three Speeds to all fifteen riders. 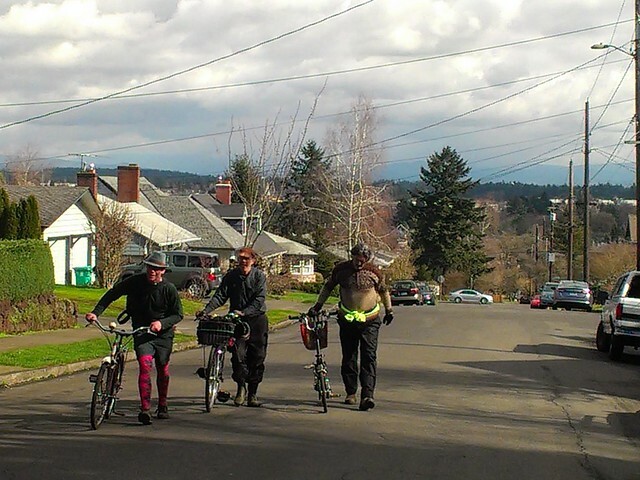 Then it was a quick downhill to the final destination of the ride, the Horse Brass pub on SE Belmont, where the remaining cyclists enjoyed food, beer, and each other's company. A fine ride overall, just a hair under ten miles. Now the Society of Three Speeds is official! The next ride will happen no later than June. Hope to see you there! For more photos of the ride, please go here. Had great time, looking forward to the next one. Thanks for all your effort and time in setting it up.